Current: LIFE AFTER DEATH OF SAVAGE DRAGON? LIFE AFTER DEATH OF SAVAGE DRAGON? Berkeley, CA - February 16, 2011 - A changing of the guard is taking place next week in Chicago. Having lost its great protector, citizens of the Windy City and the family of Officer Dragon must face a new reality. Issue 169 provides a great starting point for new readers or those that wish to be reintroduced to this no-holds-barred superhero comic that includes plenty of heavy-hitting fist-a-cuffs, good-natured humor and universal themes at a time of great change for the characters. As Malcolm Dragon, son of the famous (sometimes infamous) Savage Dragon, copes with the final loss of a superhero father who had not always been a reliable presence in his life, he must fend off nefarious villains and ne’er-do-wells. Malcolm may feel unprepared to assume such weighty responsibilities, as he must also deal with a life filled with the normal awkardness of being a teenager and feeling out of place, as well as the damaged legacy left behind by his father. SAVAGE DRAGON began in 1992, but the character was originally conceived of during Larsen’s childhood. Since the beginning, the story has moved forward in real time, including the gradual growth and aging of characters. Now the young Savage Dragon that sought to fight crime in the early ‘90s is gone, but Chicago still needs a hero. Enter: Malcolm Dragon! 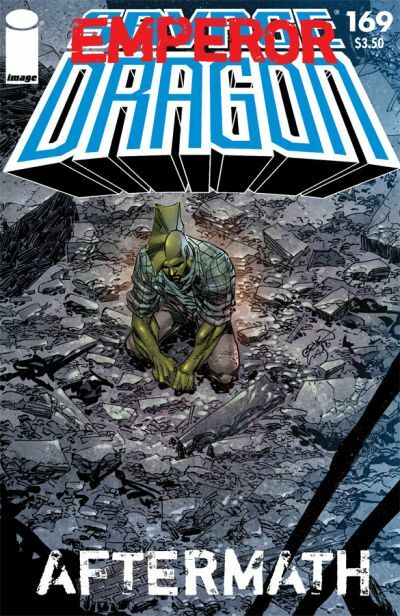 SAVAGE DRAGON #169 (DEC100491), a 32 page full-color comic book, is in stores on February 23, 2011 for $3.50.